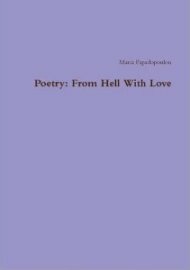 Maria Papadopoulou’s collections of twelve poems, “From Hell With Love”, addresses every aspect of love, from overwhelming joy to unbearable pain. Lies, innocence, pride and and the power of love all come under the spotlight and are described with succinct imagery. Although this book is just a few pages long, within it the whole gamut of emotions come pouring out. The anthology opens with “Slave”, in which Papadopoulou describes her lover as ‘an uninvited guest’, while her soul is his slave. She uses the metaphor ‘my mind died a painful death’ to convey the idea that she has been completely taken over through falling in love. It is a sensitive poem that presents the all-controlling feeling of love, which she hopes her lover will use to ‘give the brightest colors’ to his dreams. “Love at first sight” describes the ‘illusion of innocence’ that lasted so briefly before it ended in heartache. Papadopoulou tells us that she didn’t believe in love at first sight, but ‘fate decided to make fun’ of her. The joy of the initial feeling is beautifully pictured: “I was too busy / dancing in the sky / sleeping in the clouds’. The poem suddenly changes in tone when the affair ends as quickly as it began, but the narrator will ‘forever treasure’ the memory. “Passion does not live here anymore” looks at a relationship that has lasted so long that the romance has died; it’s just a ‘waste of precious time’. There is even unpleasantness when she touches her partner: ‘you look annoyed, / as if you were bitten by a bug’. In contrast, the poem “It has been years” sensitively describes precious memories of a long-lost love that are beautifully evocative: ‘when I want to feel your touch, / I dive into the sea waves’. She uses the metaphor ‘the food my soul needs to stay alive’ to convey how vital the memory of her lover is even after several years. In “Hello Pain”, Papadopoulou personifies pain and describes how it became her friend after initially being a competitor. This is a fascinating poem that throws a new light on an attitude to pain caused by broken love affairs. Pain showed the poet ‘a creative outlet’ for her ‘negative feelings’, helping her at a time of desperation. Perhaps the most unusual poem here is “The stranger in the mirror”, where the narrator, thanks to her lover, is ‘no longer afraid’ to look at her reflection and talk to herself. She feels her lover’s ‘protective wings’ as chills run down her spine and she can confront herself, an act that had been impossible in the past. This is an anthology that will surely touch the heart of everyone who reads it and can relate to these experiences of love, whether tender or painful, in some way. It is a very moving collection of poetry. No Comments on "From Hell with Love"